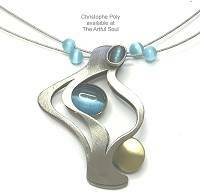 Using modern materials such as aluminum, brass, acrylic and rubber, Christophe Poly creates his jewelry in an architectural approach, where each piece is combined in a complex design of perfect balance. Handmade in his Montreal shop, small parts of wire, plate and tubing are cut with sizes and shapes to be lightweight, then lead-free soldered together. Mixed metal plating colors and finishes complement each other, special coatings protect the surface, glass stones add a splash of color to complete. 2-1/4 inches long, 9/16 inch across, on silver plated french earwires. Constructed of brass and/or aluminum that is plated. Shiny golden finish wire curves down to hold a nickel finish square to one side, and square peach catseye glass to the other, lavender glass cube on wire above. 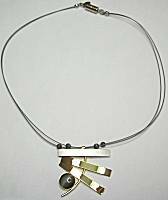 Pendant measures 1-1/8 inches across, 1-1/2 inches tall, constructed of brass and/or aluminum that is plated. Nickel metal finish back and front pieces are cut to undulate like a flickering flame, capturing oval aqua blue cats-eye cabochons and a satin gold circle to the side. Pendant is suspended from a pair of thin cable wires, 17 inches long, secured by magnetic clasp. Aqua beads roam freely, a pair on each side, along the cable. 2-5/8 inches long, 3/4 inch across, on silver plated french earwires. Constructed of brass and/or aluminum that is plated. 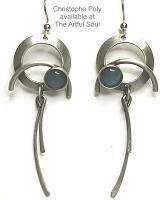 Nickel silver matte finish circle has curving bars across and dangling below, a single round aqua cats-eye cabochon nesting on one side.